The first sign that this may be a fraudulent email I noticed is the mail says there was an unsuccessful access on “24 June 2006.” It could be more believable if it says “January 5, 2007″ than “24 June 2006″ as I checked my account last night and do we really use the “24 June 2006″ format? In fact, all the links at the bottom of the page are real BoA links, except the three on top right which point to the same URL but with no actual page associated with them. Though this apparently is a scam email, Yahoo’s DominKey failed to flag it. 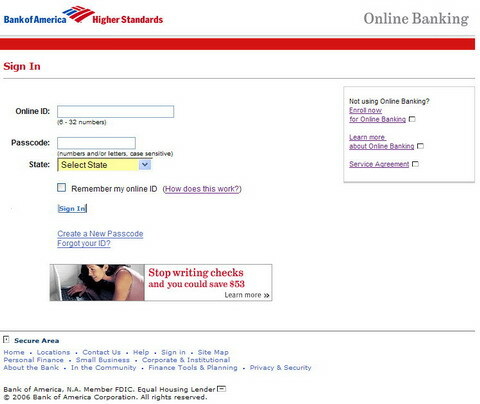 And the email was send from server3.polaristar.com which has nothing to do with Bank of America. Using a free IP lookup tool at IP2Location.com, I found the sender’s location is at Dallas, Texas. Thank you for contacting Bank of America to report a potentially fraudulent mail, commonly referred to as a “phishing” email. We take your security very seriously and will investigate this matter immediately. If our investigation determines that the email is fraudulent, we will take steps to have the site shut down. There’s a lot of BofA fraud out there. I used to get fraudulent telemarketing calls all the time. It’s seems everyone’s getting in on the act now. Thanks for the head-ups since I own multiple accounts with Bank of America. 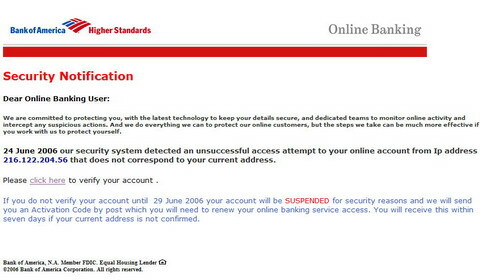 Good catch…BoA seems to be a favorite target for scammers.